These dainty square cakes are easy to achieve and can be made quickly in large quantities for a special occasion or a cake and bake sale. The cake is a straightforward sponge flavoured with lemon zest and brushed with lemon juice. The slab is covered in a simple lemon icing, left to set, then divided into squares and decorated with iced daisies. 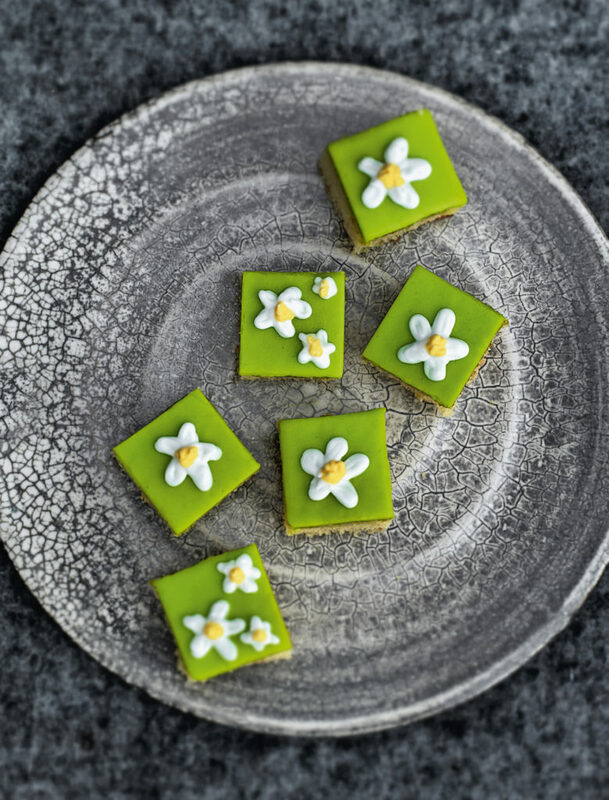 To form a little contrast between the petals, and in reference to the cake’s citrussy taste, I add a touch of lime-green food colouring to the lemon icing. Heat the oven to 180°C/Gas Mark 4. Line a 22cm square cake tin with baking parchment. Sift the flour into a bowl and set aside. Using an electric mixer, beat the softened butter with the caster sugar and lemon zest for about 3 minutes, until light and fluffy. Beat in about a fifth of the beaten egg, then reduce the speed of the mixer and add 2 tablespoons of the flour. Repeat this process until all the egg is mixed in, then gently fold in the remainder of the flour. Transfer the mixture to the prepared tin. Bake for 10 minutes, then reduce the temperature to 165°C/Gas Mark 3 and bake for about 30 minutes longer, until a skewer inserted in the centre comes out clean. Leave to cool in the tin for about an hour, then turn out on to a wire rack to cool completely. To make the lemon icing, sift the icing sugar into a small bowl and gradually add the lemon juice until you have a thick but spreadable mixture. Mix in a little food colouring, if you like, until you have the desired shade. Turn the cake upside down, peel off the baking parchment and brush or drizzle with the lemon juice. Spread the lemon icing evenly over the surface, using a palette knife. Leave to set for 30 minutes. You now need to divide the slab into 4cm squares. For a 22cm tin, this means cutting it 5 x 5 after trimming off the edges. For accuracy, it is best to place a ruler on the side of the slab and make little indents with a knife along the edges. Allow for the trimmings, then mark every 4cm. When you are happy with your division, cut the cake into squares using a sharp serrated knife. Clean and wipe the knife between cuts. You can leave the cakes as they are or place them in paper cake cases. Make the royal icing for the daisies by placing the egg white and lemon juice in a bowl and sifting in half the icing sugar. Mix with a spatula to form a creamy paste. Gradually mix in the remaining icing sugar with a wooden spoon or a firm spatula until the mixture is smooth and forms soft peaks. Lift out the spoon to test the peaks; if the icing is too soft, add a little more icing sugar; if it is too stiff, add a few drops of lemon juice or water. Put the white royal icing into a parchment piping bag (holding a little back for the yellow) and use to pipe a daisy design on each cake. Add a little yellow food colouring to the remaining royal icing to make the flowers’ centres, or use mimosa cake sprinkles as an alternative. You can create more vibrant designs by adding a variety of colours to the lemon icing. For multiple colours, it is best to cut the slab into strips before spreading the icing on – i.e. for 5 colours, cut it into 5 strips. Divide the icing between 5 small glasses and add colourings to create a rainbow effect – for example, red, orange, yellow, green and blue. Ice each strip of sponge with one of the colours. Leave to set, then cut into little squares, trimming off any icing that dripped down the sides. Decorate as before, or keep them simple and arrange in a rainbow pattern. Konditor and Cook: Deservedly Legendary Baking by Gerhard Jenne (Ebury Press). Photography by Jean Cazals.